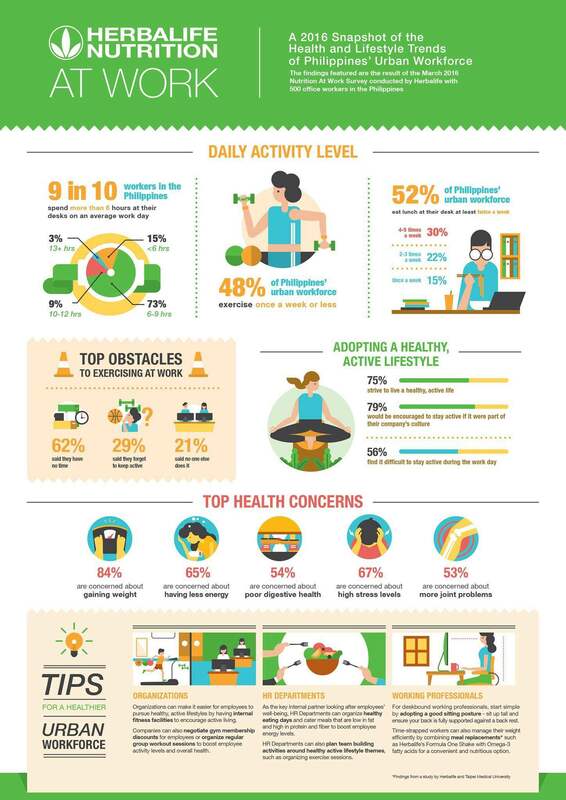 Herbalife, a global nutrition company, has released the findings of the new Nutrition At Work Survey, whichrevealed that the majority of Philippines’ workforce leads largely sedentary lifestyles, putting them at risk of obesity. The Survey1, which was designed to understand the lifestyle habits and attitudes of Asia Pacific’s modern workforce, was conducted in March with 5,500 full-time workers in 11 Asia-Pacific markets, including 500 workers from thePhilippines. “With a majority of Philippines’ workforce leading largely sedentary lifestyles, our mission as a global nutrition company is to help people in thePhilippinestake practical steps towards leading healthy, active lives.By inculcating positive nutrition and active lifestyle habits to people in the Philippines, we hope that this will, over time,help reduce obesity risks and lead to positive improvements to the well-being of our people,”said Mr. Rosalio Valenzuela, General Manager of Herbalife Philippines. Gary Small, M.D. has recently visitedthecountry and shared his expert views on digital dementia and brain aging at the “A Smart Way to Healthy Aging: A Talk by Gary Small, M.D.” event.Dr. Small, a specialist in brain health and aging, has authored over 500 scientific works and received numerous awards and honors, including the “Senior Investigator Award” from the American Association for Geriatric Psychiatry. During the talk Dr. Smalladdressed health and nutrition related issues associated with sedentary lifestyles and share practical tips on how today’s workforce can live healthier lives by making simple changes to their daily lifestyles. Health and medical professionals, academics, as well as the general public have also engaged in lively dialogues with Dr. Smallat the event, and had the chance to network with like-minded professionals through the Herbalife Asia-Pacific Wellness Tour platform. Chin-Kun Wang, an expert in metabolism and nutrition, with a focus on the clinical evaluation of nutritional supplements, nutraceuticals, functional foods and herbs.He was awarded the National Award of Biomedicine in Taiwan in 2008 for his contribution to medical education. This entry was posted in Events & Press Release, Health & Wealth and tagged Herbalife.